Many Nigerians were excited with the news that the country was at last launching a “national carrier.” But the first downer came with the horrible naming of the brand, “Nigeria Air” instead of a more proper “Nigerian Air,” and the grammatically convulsive slogan, “Bringing Nigeria Closer To The World,” implying Nigeria was somewhere outside the world, perhaps in someone’s pocket. It appeared the profile was drafted by the same never reprimanded fellow in the Buhari presidency who was so idea-lazy, he had to plagiarize from late Charles de Gaulle and Obama to write Buhari’s basic addresses. But the grammatical poverty in the branding was the lesser of the scandals of the advertisement. A rapid review of what was launched immediately exposed the great scam that was presented to the bleeding country apparently in political desperation. “Nigeria Air” is not a national brand but a private company. It is a cabal brand being supported and promoted by the Buhari government. 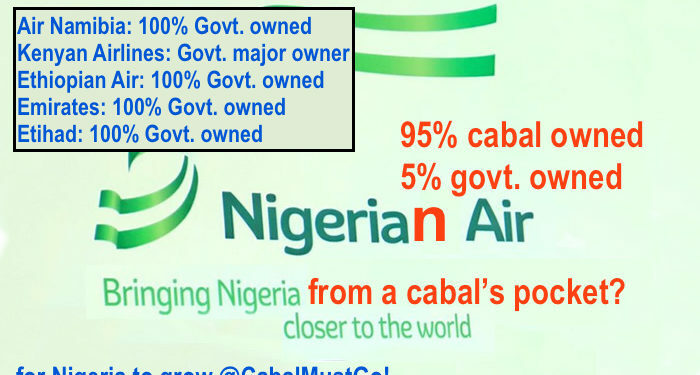 The cabal were enticed with God know what massive benefits – including half rate FOREX, tax cuts, duty exemptions etc – to buy a few airplanes and launch under a “national brand” name, as a tact to fool gullible Nigerians into thinking they were getting a state-owned and people profiting brand. Abeg o, will this government buy 5% shares in my company too, give me super deals and breaks, market me in the UK and advertise my business in all local and global dailies. Someone please link me to them so I can enjoy like the cabal do. “Nigeria Air” is no different from “Dana Air,” “Arik Air” and all other cabal-owned airlines operating in and out of Nigeria. It is a pathetic shame how the Nigerian governments of this dispensation, PDP and nPDP-APC successively lie to the people and either privatise majority ownership of government companies or in other scams, market private companies as though they are state business. Let’s quickly compare with some African and Middle East airlines. 1. Air Namibia – Solely Namibian government owned. 2. Ethiopian Airlines – 100% owned by the Ethiopian government. 3. Kenyan Airlines – was 100% government owned, now privatised however with the government-people of Kenya still being majority shareholder, holding 48.9%. 38.1% owned by local banks, 7.8% by KLM and 5.2% by other shareholders. 4. Emirates Airlines – a subsidiary of The Emirates Group, itself is a subsidiary of the Dubai government’s investment company, Investment Corporation of Dubai which is a state-owned holding company that can be characterized as a sovereign wealth fund owned by the government of Dubai, United Arab Emirates. 5. Etihad – wholly owned by the government of Abu Dhadi. We can go on and on. So in summary, while across the world, national carriers are to the profit of the masses, in Nigeria, the government advertised carrier is a private business for the same ‘ol wealthy few. In Nigeria they pretend that government cannot run businesses. I have released a video debunking this fraudulent premise in the past. I showed how it is only monkeys that cannot run businesses and that if indeed those in power felt they were monkeys who could not run state-owned agencies, they should privatise the government of Nigeria itself, because clearly running agencies is easier than running or ruining the lives of the 190 million people…and their admitted and demonstrated inefficiency is seen in the security collapse in Nigeria today with hundreds dying daily. We can only imagine which of the usual suspect cabal own “Nigeria Air.” The typical sponsors of PDP-APC and the new friends and family in he corridors of power. Hopefully the Nigerian media will help us know those who this government free promo will help make more billions sooner than later. 2019 by God’s mighty grace, we will take over and restore honesty, decency and people-centered and conscious prosperous development. We will take back Nigeria from the greedy sleazy and slimy cabal.